The Walther ultra-grade heavyweight Airsoft P99 pistol package, complete with 2 x 400rds of BBs, 2 x authentic airsoft P99 replica pistols, and a tactical target is an incredible deal! The P99 is a premium grade Airsoft pistol that bears the signature Carl Walther marks etched both onto the slide and the signature-textured pistol grip. The pistol also features integrated hop-up to enhance realism, functionality and performance. The P99 is quality constructed with metallic internal components and features an Extended Life Trigger System for long-lasting rugged durability. A performance slide has also been installed straight from the factory for maximum shooting power and accuracy. As a result, it"s capable of shooting 260-280 fps with an effective range of over 70 feet. In addition, the integrated hop-up system improves accuracy by putting a backspin on the BB as it exits the barrel for maximum effective range and a straighter shooting trajectory. 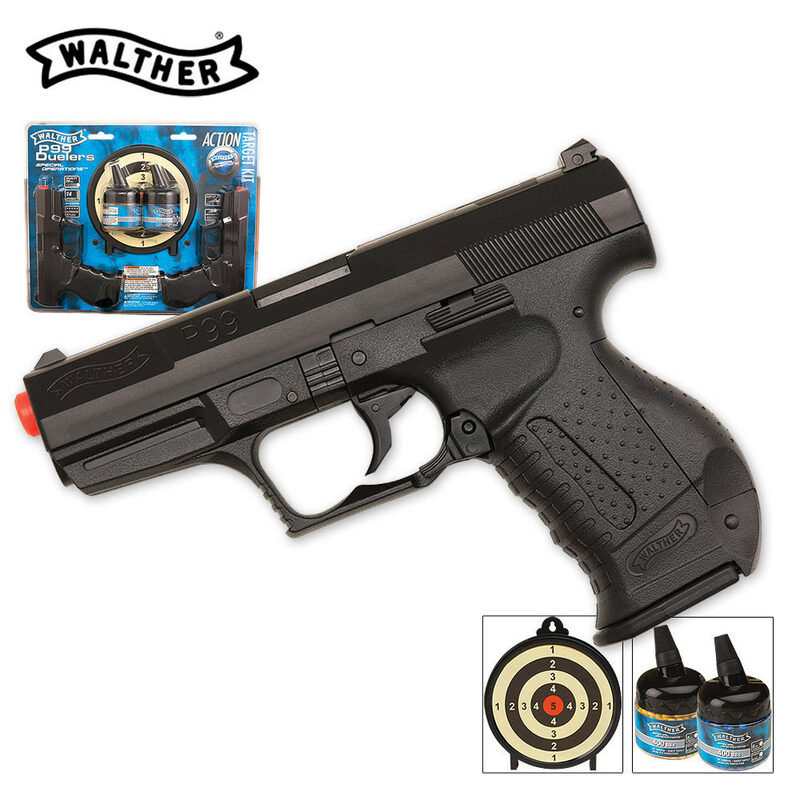 From the high-grade components to the realistic feel, this pistol set makes for hours of fun. I got these gun and I liked them. They don't curve very much and it is a pretty well made gun. Besides the magazine and some of the inner parts the gun is completely plastic. A good starter gun, and it's good to have an extra magazine on you.